All about Chandigarh Teacher Eligibility Test (Chandigarh TET) ✓ Notification ✓ Application Form ✓ Syllabus ✓ Admit Card ✓ Eligibility ✓ Question Papers ✓ Sample Papers ✓ Answer Key ✓ Exam Date ✓ Exam Pattern ✓ Cut-off Marks ✓ Preparation Tips for the post Primary Teacher (from 1st class to 5th class) and Upper Primary Teacher (from 6th Class to 8th Class) examination to be held in 2019. Candidates interested in appearing for the exam should apply only through online process from official website of Chandigarh TET i.e. www.chandigarh.gov.in. The Government has Decided to Conduct The Chandigarh Teachers Eligibility Test – Chandigarh TET 2019 Exam Once Again in the Current year to help more Number of Candidates to Apply for Chandigarh TET 2019 The State Government has announced the TET Chandigarh 2019 Latest Schedule now. ✓ B.A or B.Sc graduations with 50% of minimum marks are also considered as the qualification of candidates. ✓ B.Ed qualification is must before you take up Chandigarh TET. ✓ Paper I qualification is additional credit to this examination but anyhow candidates those who have cleared both will be only given authority to take up the classes for all levels of students. 1. A person who scores 60% or more in the Chandigarh-TET examination will be considered ‘Chandigarh TET passed’ or ‘Chandigarh TET qualified’. This will be the qualifying marks for all categories. You can answer the paper in English or Punjabi, except the language sections. You can find the material for preparation of the above topics in any national TET guide. Mathematics and Science for candidates who wish to teach mathematics and science; or, Social Science for candidates who wish to teach Social studies. For other candidates, they can attempt either of the two papers. Here again, you can attempt the paper in English or Punjabi, except the language sections. Any national level TET guide would be good practice material for paper-II as well for Chandigarh TET exam. Paper-I is of one and a half hours duration. It is an objective test with multiple choice questions. Each question has 4 options, out of which only one is correct. Each section in paper-I has 30 questions, carrying one mark each. There is no negative marking involved. Paper-II too is a multiple choice based test of one and a half hours duration. The first three sections in Paper-II have 30 questions each with every question carrying one mark. The fourth section in this paper has 60 questions, with each question carrying 1 mark. Here again, there is no negative marking involved. Candidates will be able to download their Admit Card from two week of examination. 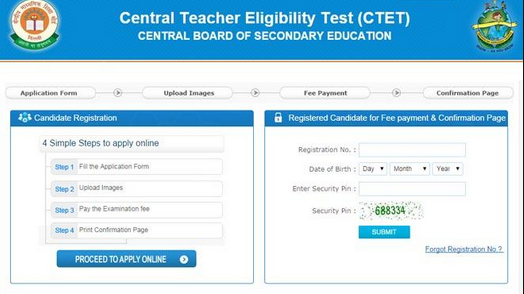 Candidates are requested to visit the same website to download their Admit Card For Chandigarh Teacher Eligibility Test (Chandigarh TET) Exam 2019. 1:- Log on to the official website www.chandigarh.gov.in. STEP#01: Log on to official website of Chandigarh TET. to apply online for Chandigarh TET. STEP#04: Fill and edit Chandigarh TET 2019 online application form.